Text Columns is the property of Section formatting. /// Working with text columns. // Let's create a document with 4 columns. // Fill our columns by any text. // Save our document into DOCX format.
''' Working with text columns. Dim documentPath As String = "TextColumns.docx"
' Let's create a document with 4 columns.
' Fill our columns by any text. 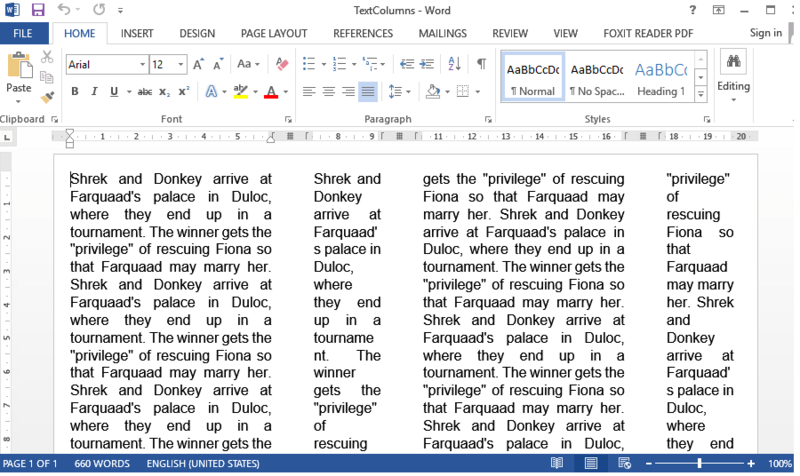 Dim text As String = "Shrek and Donkey arrive at Farquaad's palace in Duloc, where they end up in a tournament. The winner gets the ""privilege"" of rescuing Fiona so that Farquaad may marry her. " ' Save our document into DOCX format.